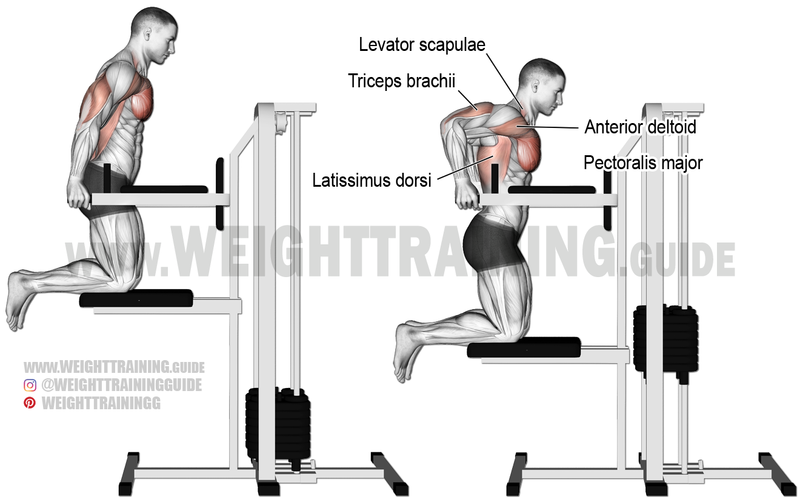 Kneel onto the knee pad of the assisted triceps dip machine and grasp the shoulder-width bars. Keeping your torso upright and your elbows tucked into your body, inhale as you lower yourself until you feel a mild stretch in your shoulders. Exhale as you push yourself back up to the starting position until your elbows are almost fully locked. Keep your head up and torso upright. Keeping your torso upright and elbows tucked into your body are important to keep the emphasis on your triceps brachii instead of on your pectoralis major. The difference between a triceps dip and a chest dip is that with the former you keep your torso upright and tuck in your elbows, whereas with the latter you lean forward and flare out your elbows. Use the machine-assisted triceps dip to strengthen the muscles necessary to be able to perform the proper triceps dip. Keep reducing the amount of assistance provided by the machine. If you don’t have access to a machine, you can use resistance bends (i.e. the band-assisted triceps dip). See the second video.